This volume contains a pair of exploratory essays by Masonic scholar William Harvey. The first seeks to explain the origin and meaning of the word Tyler, as well as describing the history and duties that appertain to the official who guards the Doorway of Freemasonry. 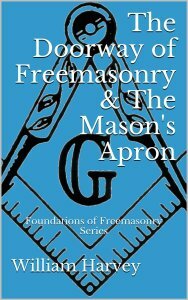 Harvey’s second essay, “The Masonic Apron”, begins by chronicling historical usages of the garment in cultures and traditions throughout civilization. From there, we are led through early incarnations of the apron and its symbolism in masonry, until we ultimately arrive at what we now all recognize as the universal badge, common to the collective Masonic brotherhood.